Retaining modernism’s dedication to a sensuous and intuitive investigation of painting’s evolving properties, she has turned inside out many of the solutions developed by her peers and predecessors. Without completely rejecting their example, this has opened her work up to new contexts, and she forms a bridge between older generations and the art of younger painters in Britain. She has created a pictorial world that distantly reflects our experience of the world at large, that filters through her own vision our awareness of light, space and movement, that values the startling detail as much as the certainly delineated whole. Stating complexity with economy, in images both resonant and self-contained, her precision allows ambiguity to be effective. Morris returns the world to us filled with levity, joy and wit. Light and space are rendered as substance; the hue and materiality of colour luminously open up. Morris, freed by abstraction to walk ‘the path of colour’ without the requirement of any direct reference to any thing but the joyful manifestations of the light that colours every thing and fills the space between, has found her own truthful inexactitudes in the vital optical relations between one quasi-geometric area of a painting and another, and between those and still others. And neither are those colour-shapes merely planar or Euclidean, but, like the colours of the world, unfixed and in constant dynamic relation between surface and emanation, distance and nearness, hue and tonal variegation, texture-light and film-colour; between the indeterminate translucencies of shimmer and shadow and the opacities of the reflective object. 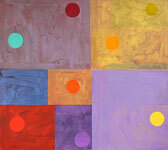 "...Mali Morris's new paintings are vivid, playful and generous. Some are amongst the most complex she has made in recent years, others the leanest. All are part of her exploration of abstract painting that stretches back over forty years..."
" …one soon forgets the geometric configurations that perhaps appear so prominent during an easy first glance. This must be because in giving one’s attention to these works, which have been produced in an elaborate and highly effective fashion, the complexity of their construction (terms arguably more apt in the present case than “composition”) fosters significant results. Colours within Morris’ paintings don’t act in a predictable manner……What results is a mode of colouration that could not be achieved by other means……The incredible and engaging luminosity she achieves, the swing of the space, the associations which emerge, come about through her close engagement with the particularities of what is happening on the canvas as she works it. This approach is therefore not formulaic. Each painting is begun from a position of accumulated technical know-how, history and experience, but the question of the work’s accomplishment or success is never marked out in advance…"
Mali Morris is a painter who makes you think about paint, and whose paint asks you to think about light. She is not concerned with making paintings represent recognisable objects, but the world, through light effects, is in her paintings... 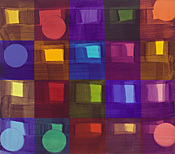 Her paintings are alive not just to a history of abstraction, but in a dialogue with her own method of experimentation. The issues seem to be light and rhythm, and what painting is. From the catalogue essay ‘Mali Morris – Recent Paintings’ 2003, by Geoff Rigden, artist .…alongside the novel, The Towers of Trebizond, by Rose Macaulay, a seascape by Albert Marquet, a Gene Kelly dance sequence from On The Town, and a recorded disc by the jazz tenorist, Lester Young. With these artists she shares the combined gifts of understatement and authority, clarity, coolness and depth. Her work has never been clamorous nor overwrought and at its present stage is at its most radical, sublime and eloquent….